Why isn’t dictator spelled DICKtator? Are there any female ones? Or any that are not dicks? 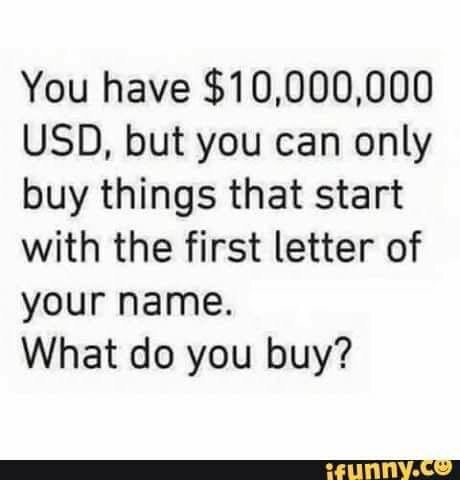 So what would you buy with the first letter of your name? • Villa – somewhere sunny all year round, but not too hot. • Vanity Room – I’d set aside a room for all my clothes, accessories, footwear and makeup and set it out so that I can easily see and access everything. • Van – Of the VW Camper variety so that I could hit the road in search of adventure. • Varnish – of the nail variety. A girl can never have too many nail varnishes! Mmm yum! Those jellys I like ! Not having been to Arkansas, I don’t want to belittle that state. But I can highly recommend Alaska, since I lived there once! I bet it’s beautiful up there! Haha, DICKtator! Think I could buy a lot of JAM with that amount of money.